Personally, this is one of my favourite recipes to make when I’m at home. The reason I don’t make these more often is because the list of ingredients seems never-ending, which is not exactly ideal when you’re a student on a budget. For some reason, at home we typically have most of these things on hand (why? I couldn’t tell you), so it obviously makes it a lot simpler to put together. I like these a lot because they’re pretty healthy (they can also be made gluten-free) but are still really yummy! 1 Bunch of chopped spring onions. Brown chicken with a little oil in the pan. Then add onion,garlic,soy sauce, hoisin sauce, ginger, vinegar and chili sauce. Cook until meat is crumbly and brown. Add water chestnuts and green onion. Cook couple of mins. Stir in sesame oil. 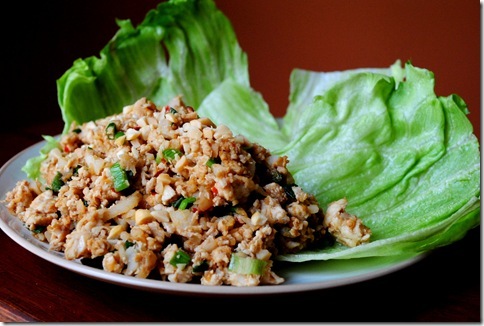 Serve in lettuce wraps with special sauce. Special sauce Add water, soy sauce, rice wine vinegar, ketchup, Lemon juice, and sesame seed oil together and mix. Original recipe calls for 1/4 cup of sugar but we found it too sweet. Mix hot mustard, water and garlic and chili paste together. When ready to serve mix the 2 sauces together. Serve yum. Notes: Can also be made ahead of time and stored in an air tight container. With Valentine’s Day just around the corner I felt it necessary to share a sweet treat that I recently tried out myself. 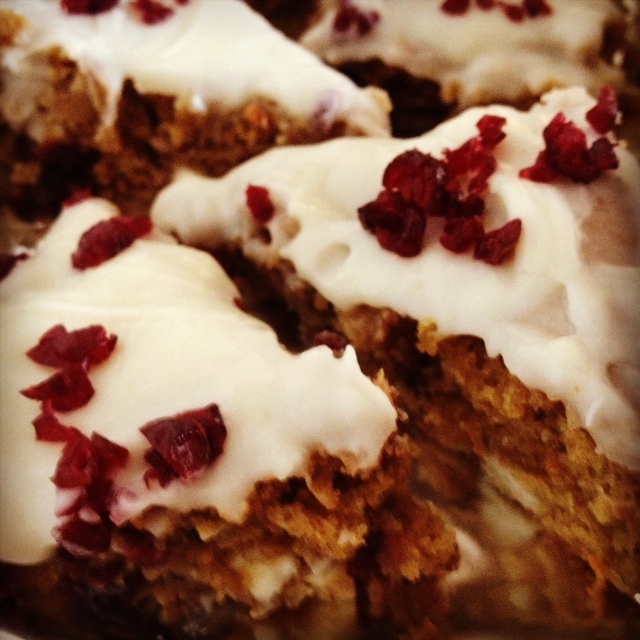 In case you aren’t familiar with them, Cranberry Bliss Bars are a Starbucks favourite that appear around Christmas time and never seem to last long enough. To break it down, they’re essentially a blondie with white chocolate chips and craisins, topped with cream cheese icing… and craisins… with a white chocolate drizzle. Yeah, it’s mind blowing. I made these guys to bring along with me to the Queen’s Yoga Club Partner Yoga even that we held this past Saturday. I’d never done Partner Yoga before and I honestly can say I’ve never had so much fun during a practice! After our session we all mingled and tasted the delicious treats that each of the exec members contributed. I was very pleased to see that the bars had disappeared in less than 5 minutes with a few awesome comments about how out of this world they were! Always a boost! Below is a copycat recipe I adapted from this blog to make these drool-worthy slices. 1.) Preheat oven to 350 (F) degrees. Grease a 9 x 13 pan then set aside (I also like to line the pan with parchment paper (or aluminum foil), leaving some hanging over the two long sides- this allows the bars to be pulled out of the pan after baking for easier cutting). 2.) In a medium bowl add the flour, powdered ginger, salt, baking soda and baking powder. Set bowl aside. 3.) In a large bowl, cream the butter and brown sugar until smooth. Add eggs, vanilla, and orange zest and mix well. Gradually add the flour mixture and blend until combined. 4.) Stir in cranberries and white chocolate. Pour the batter into prepared pan and spread evenly. 5.) Bake 25-30 minutes, until edges are light brown and a toothpick inserted in the center comes out clean. 6.) Prepare frosting by beating the cream cheese and butter together until smooth. Add the powdered sugar and vanilla. Beat about 1 minute until fully incorporated. 7.) Assemble dessert by spreading the frosting onto the baked and cooled bars (MAKE SURE they are completely cool – I was in a rush and had to ice mine after only 8 minutes of cooling and it got pretty melty!). Sprinkle additional cranberries on top. Notes: You can add orange extract into the frosting as well to give it a few citrus-y notes. I left mine plain and felt that the orange zest in the bars themselves did the trick! You can melt the leftover white chocolate and drizzle over the iced bars.